As much as you cherish your Jeep Grand Cherokee in its present form, if you are like a lot of enthusiasts, the call to tinker and improve its look with aftermarket accessories is an ongoing passion. 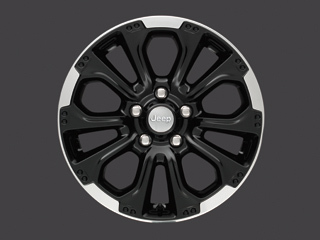 So give your late model Jeep Grand Cherokee a new set of wheels with an order to JustforJeeps.com for 18" Black Cast Aluminum Wheels by Mopar. Made for challenging off-road conditions, the wheels, Item No. 82212154, are sold individually and fit Grand Cherokees manufactured in 2011 or later. Center cap is included. Wheels are 18" x 8". Had these installed a couple months ago and am not disappointed. So far seem to be a quality product and as advertised. They look awesome on my '13 Grand Cherokee with Michelin LTX A/T 2 tires. Just what I needed to fit my 275/65R18 Duratracs on my WK2 2014 Grand Cherokee Limited Ecodiesel with Quadra Lift.